Later’s Best Time to Post (BTTP) feature helps you identify your most optimized days and times to post to Instagram for maximum engagement. Our algorithm determines your best time to post by analyzing your historic post data on your top performing posts and then highlights the times right on your content calendar. So with these times in mind the next time you’re scheduling your posts simply find the pink time slots, schedule your posts, and see your engagement increase! Tip: Now that you know your best times to post to Instagram, it’s time to automate your scheduling process! Set up a Quick Schedule by assigning a time slot to your best times to post. How does Best Time to Post work? To determine your best times to post, Later analyzes a combination of posts published both through Later and directly through Instagram. In order for the data to be statistically significant, the algorithm will only utilize your last 50 (or more) top performing posts in the last 6 months and removes any outliers (posts with extremely high or low engagement). Important: If your Instagram account has less than 50 posts in the last six months you will not see any suggested times. Since your BTTP is based on previous posts’ performance, if you consistently post on Tuesday, Thursday and Fridays at 9AM and 5PM, the best time to post will only suggest these times. Therefore to ensure you get a more encompassing insight into your best time to post we recommend experimenting scheduling content at different days and times and let us do the math for you! Later can suggest up to 7 best times for you to post throughout the week, however you may only see 3-4 if we can only find a few times we strongly suggest -- remember: quality is better than quantity! Tip: To get the ultimate insights for your best time to post, experiment with scheduling content on different days and times for a few weeks. That way, the next time we analyze your best time to post, Later can gather a more comprehensive report with more data points! How do you enable Best Time To Post? To see your best time to post, you need to enable it from your Calendar Settings. Note: We default to enabling your Best Times to Post if you're on a Business Plan that includes it! Your calendar settings are a small gear icon, which can be found at the top right of your calendar. 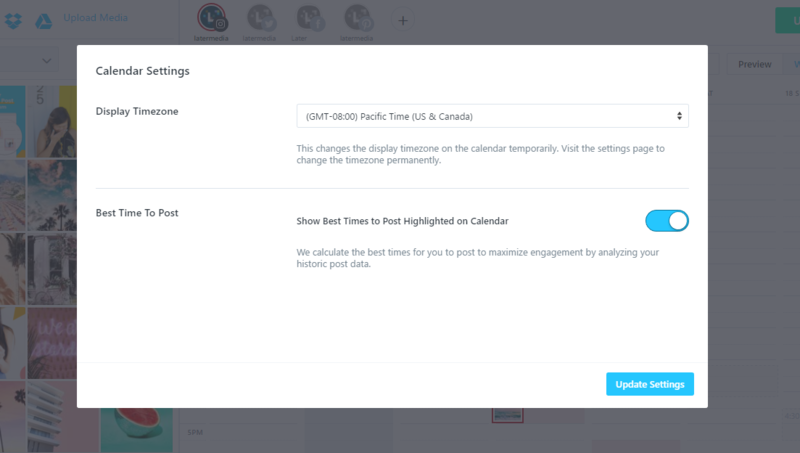 Select your calendar settings and toggle to enable your Best Time To Post optimization. Important: Running your Best Times to Post may take up to one hour to gather the necessary data! Make sure to only select one Instagram account in the calendar view to enable your Best Times to Post slots. Once your best time to post has been enabled, you should see the highlighted times on your calendar! If you're having trouble enabling your Best Times To Post, or they are taking longer than usual to generate, please contact us and we'll be happy to help!